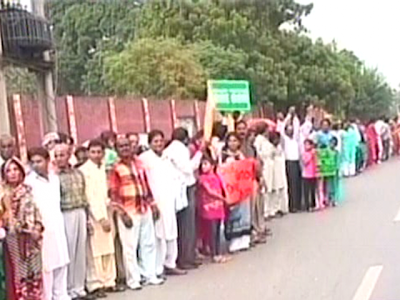 British Pakistani Christian Association: Human chain tactics spread from Egypt to Pakistan? Creating a voice for Pakistani Christians! Human chain tactics spread from Egypt to Pakistan? For what is reported to be the second time in the several weeks following the double suicide bomb attack on a Peshawar church, Muslims have formed a human chain outside a church during or shortly after it's Sunday service. About 200-300 Muslims are reported to have formed outside St Anthony's church in Lahore, led by a Sunni Mufti, with banners like 'One nation, one blood' and 'One God, many faiths'. The first such human chain event was last week, outside St Patrick's cathedral in Karachi. The Mufti preached in the courtyard outside the church on tolerance, and the priest came out and stood beside him after the 2 hour service. Moderate Muslims surrounding churches while they have services is a tactic that has happened often in Egypt to try and deter attacks by Muslim Brotherhood and Salafi fanatics. In addition, some reporters are saying that in the wake of the bomb attack, some quite hard-line religious parties in Pakistan have condemned the attack and are starting to call for the government to take more action to protect religious minorities, including immediate compensation to the bereaved families and funding the medical treatment of victims. In addition, Shia Muslims in Pakistan, another persecuted minority, have ordered three days of official mourning over the victims of the Peshawar attack. There are reports that one political leader has already 'spoken out' against the blasphemy laws, although it is not made clear what this actually involved. We welcome these developments, as far as they go. If they are genuine, and not an attempt on a national scale of the tactic of whipping up mobs against churches, and then using this to pressure Christians during the 'reconciliation meetings', which has been used locally in the past, then this is useful as far as it goes, but we have seen so many words and so little action in the past. We are also concerned that it may be something of a public relations exercise, but, if these groups are for real, then we will see action. We will watch developments with great interest. This is a very kind gesture. God Bless these moderate Muslims. However for the long term Christians must consider having their OWN armed guards at all Christian institutions. And we in the West must help them with this if they want it. How long before Christian institutions in the West need to provide our own armed guards too?! This is an excellent example of faiths working alongside each other. 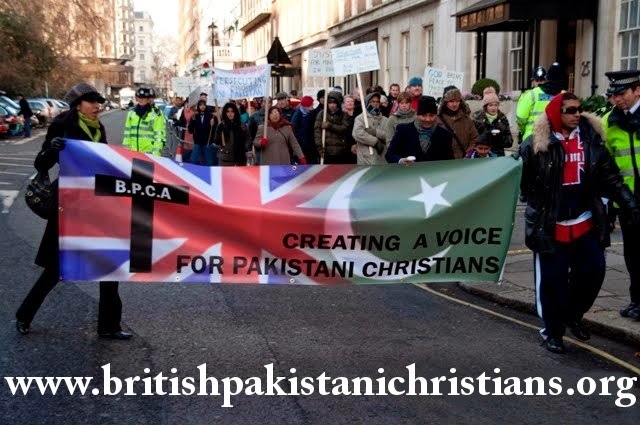 We are the British Pakistani Christian Association team headed up by Wilson Chowdhry. United Nations urged to take action on persecution of minorities in Pakistan! Update on Asia Bibi - Blasphemy Law death sentence victim! How far will Pakistan support Iran? Osama Bin Ladin killed by American Special forces in Abbottabad! Click here to buy our fashion bangles and support Pakistani Christians. Every time you view this advert the BPCA is paid 5p please take some time to do so! Britain's Foreign aid Budget should be used to espouse Humanitarian reform in Pakistan. Save Asia Bibi innocent mother of 5 sentenced to death for false blasphemy. Reform the Blasphemy Law of Pakistan or abolish it! These links have not been vetted and the opinions expressed by others who are linked to this blog are not our opinions. We facilitate an opportunity for all Pakistani Christian Organisations to field a link on our blog if they choose to and a very simple check is made on content.